Initiated in 1998, the NCASI Long-term Receiving Water Study (LTRWS) is a long-term (>10 years), multi-faceted, study designed to evaluate potential effluent responses in U.S. receiving waters. These streams represent both warm and cold water stream types, different geomorphology and stream size, a range of instream waste concentrations (0.2-33% effluent), and different mill process types (bleached and unbleached kraft). The LTRWS was developed with input from an industry committee with knowledge and skills in aquatic biology and environmental issues related to pulp and paper mill effluent discharges. The study is guided by a panel of scientists with expertise in aquatic ecology, toxicology and chemistry, and relative risk assessment. The scope and framework of the LTRWS address two broad objectives: 1) to determine if there are detectable differences in biota upstream and downstream of mill effluent discharges, and 2) the significance of these differences in terms of broader stream ecological functioning (Hall and Miner 1997). To address the objectives and goals of the study, the experimental design needed to be broad and incorporate multiple spatial and temporal scales, field and laboratory assays, and biotic and abiotic components (Hall et al. 2009a). As such, the study employed a “whole community” approach examining the biotic community structure and biomass of multiple trophic levels (fish, macroinvertebrates, and periphyton), habitat conditions, and water quality parameters. Monitoring elements and methods could be added, deleted, or modified based on study data based on initial-experience protocols, site-specific considerations, and an assessment of accumulated data. For example, biological monitoring frequency was reduced from four times per year in the initial years of the study, to twice per year once there was sufficient data to assess seasonal and annual variability. 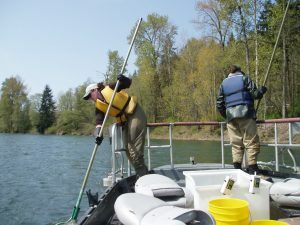 Measurements were taken multiple times per year at multiple sites upstream and downstream of effluent discharges to determine the consistency in measured endpoints across seasons and years, allowing naturally-occurring spatial and temporal variation to be distinguished from effluent responses. Findings from this study have been presented at NCASI, stakeholder, and professional science society meetings; and published in NCASI technical reports and the peer-reviewed literature. Results from this robust dataset show that modern effluents often have no effect on biota during short- and long-term laboratory exposures, even in 100% effluent. 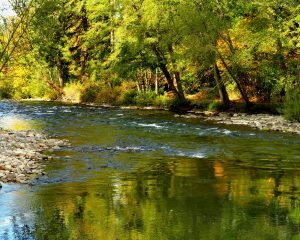 Laboratory assessment offers insight into in-stream biological response, but consideration of in-stream effluent concentration is necessary for interpretation of risk. While lower level effects have been observed in some laboratory studies, these do not appear indicative of population and community response in the LTRWS streams as in-stream effluent-related biota changes in biota were uncommon. Rather, naturally-occurring spatial, seasonal, and annual variation were the key drivers of patterns in periphyton, macroinvertebrates, and fish, highlighting that medium- to long-term studies imperative to accurately assessing and interpreting biota and water quality patterns. First, there is a strong weight-of-evidence that mill effluents are compatible with receiving stream integrity and maintenance of designated uses. Second, the robust LTRWS dataset forms the basis of new studies to develop, evaluate, and/or interpret novel and subtle measures of aquatic organism and ecosystem health. Camille Flinders, Aquatic Biology Program Manager (cflinders@ncasi.org). The NCASI Long-term Receiving Water Study has yielded numerous articles in peer-reviewed scientific literature.